Ginger Hart does not enjoy talking about herself. As a sophomore in high school, she already has a plan of what she wants her future to be like. If she goes to an in-state college, it would be ISU (Illinois State University) or if she gets the option to leave state, she would like to attend Boston University and meet the school mascot Rhett, the Boston terrier. At either college, she wants to either major in high school education and become a teacher in “any subject but math” or she’d like to major in law and become a district attorney, so she can defend people who need representation to show innocence to crimes they were falsely accused of. As of now, she is still in high school and has all the time in the world to decide her future. She participates in many clubs such as Key Club which is involved with raising money for the school or working in charity events. She is also in Science Club and Geography Club. She is on the varsity Crimson swim team. She enjoys sports just not playing them because she isn't the most athletic. She also loves acting and volunteering for local organizations. She spends her free time with friends and family. She has many hobbies such as binge watching Netflix shows, writing and showing love to her two dogs and cat all named after presidents. 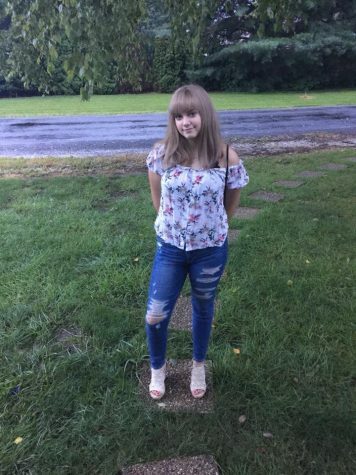 She took journalism because she has a passion for writing and does it in her daily life, and she would like to share her writing by slowly getting her work out to the public. She dreams of being an author of novels some day, but she keeps to reality and is determined to focus on her education. She can speak two languages, English and Italian, and is now learning ASL. She wants to connect to her readers by showing how much she can relate by being a normal teen and getting overwhelmed by school and goofing around.